It is easy to forget that GSM-R, as the standardised track to train radio system across Europe, has been around for over 25 years. The agreement to use GSM technology rather than Tetra was arrived at back in 1992, with development work to produce the railways special requirements taking about seven years. So, from around 2000, GSM-R networks have slowly been rolled out across Europe, with most countries now having nationwide coverage. Key to all of this has been the negotiation and subsequent agreement with ETSI (European Telecommunications Standards Institute) to allocate dedicated bandwidth consisting of a 4MHz (876-880MHz and 921-925MHz) uplink and downlink. At the time of allocation, the licensing authorities were mindful to keep a reasonable separation between the GSM-R frequencies and other users. However, such is the pressure on spectrum that, over the years, allocations have been given to the public mobile operators that encroach very close to GSM-R bandwidth – a situation which is now causing problems for radio reliability. Even though GSM-R will eventually have to be replaced, this is still several years away and remedial action has to be taken now. Rail Engineer went to meet with Network Rail to learn of the problem and the possible solution. The cab radio screen goes blank, which again necessitates a re-initiation. If these occurrences were very infrequent, it might be a reasonable risk assessment to live with the problem. However, incidents now number 240 a year, often necessitating stopping the train whilst the re-boot or re-initialisation takes place, causing two to three minutes delay. In total, this results in around 8,000 delay minutes being attributed to GSM-R interference problems. Perhaps more importantly, there are safety implications and, although no safety incidents have occurred to date, Network Rail is mindful that it is only a matter of time before one happens. Something has to be done. Checking a radio in a Class 66 locomotive. Although various companies have produced the in-cab mobile equipment, logistic considerations dictate that having a single supplier and type in any country is a great advantage if radios are to be held at depots to fit into new rolling stock and as spares for whenever a change out is needed. The cab radio supplier for Great Britain is Siemens, which manufactures the units in Poole, Dorset. Over the years, the product (currently model V3.6) has been refined to a very high level of reliability, now reaching 378,000 hours mean time between failure (MTBF) for each unit. There are some 9,000 cabs (including yellow plant) that contain a radio and an additional 2,800 are held at the rolling stock depots. To overcome the interference problem, these radios need to be fitted with a transceiver having much improved filters that give a sharp cut when frequencies are detected in adjacent parts of the spectrum. Filter technology has improved in line with increased bandwidth utilisation, so designing the filters has been relatively straightforward. The challenge is to provide this new filter within the same radio space envelope such that retro fitting work on the rolling stock is kept to the very minimum. lass 43 (HST power car) roof antennas. 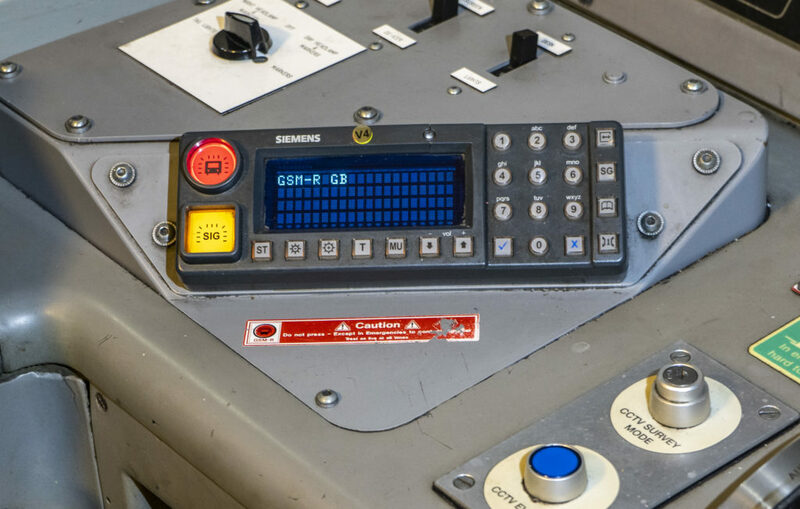 Network Rail, working with Siemens, has re-developed the cab radio to incorporate the new transceivers plus an improved power supply and audio card to further improve reliability. The opportunity has been taken both to build in a number of new filters mentioned above and also to incorporate a 4G LTE capability. 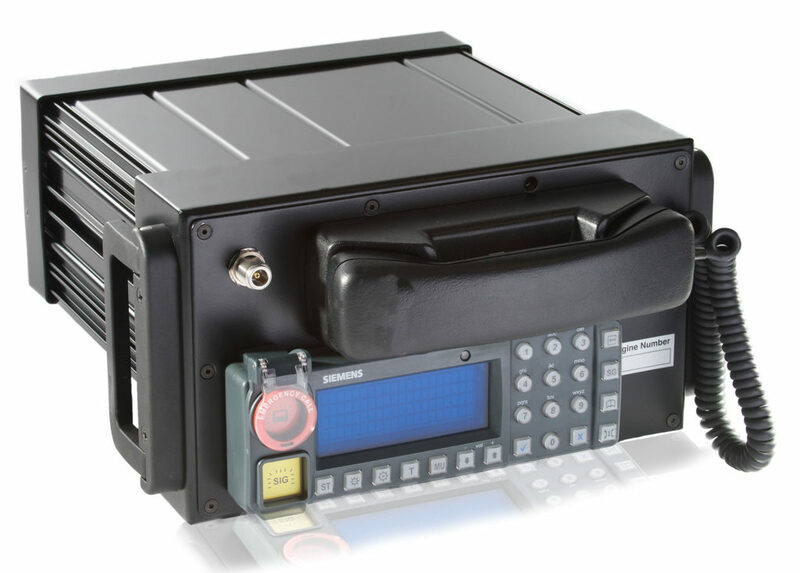 The specification required a radio product that has exactly the same space envelope, has the same connections to aerials and power supply, has the same display screen and indeed is capable of being produced by conversion of the existing radios. In short, the new must be identical to the old in terms of operation by the train drivers and in fitment at the depots. Freightliner – Class 66 diesel locos, 24 in total, where the configuration is one radio wired out to a screen display unit in each cab. The radio will be fitted in the ‘clean air’ compartment known to be one of the dirtiest environments! Transport for Wales Cambrian Route – Class 158 DMUs where the train data radio is essential for that route’s ETCS operation. These have been part of the initial trial that successfully demonstrated reliability well in excess of the contracted minimum MTBF of 50,000 hours, proving that the interference problem has been resolved. Indeed, once the number of units in service reaches a critical mass, with the improvements (audio circuitry, input voltage circuitry) introduced in V4.0, the reliability of the new unit should be at least on a par with its predecessor. One important feature is the onward connectivity to the OTMR (the on-train data recorder) and to the train’s PA system to allow direct communication to passengers from the control room should any emergency occur. GSM-R interface in a Class 43 cab. Siemens will supply a float of radios direct to Network Rail, which, in turn, will supply the radios to the train and freight operating companies (TOCs and FOCs) that will undertake the actual replacement at their maintenance depots. Mainstream deployment is expected to begin in October 2019 at the rate of 100 per week, taking until the end of 2021 to complete. After briefing the fitters, the change out time is around 60 minutes per cab. Programming the radio with the fleet number of the locomotive/multiple unit will be the responsibility of the depot, as of now. The yellow fleet of on-track machines must not be forgotten as they also carry GSM-R radios and change out is likely to happen at the plant machine depots. Replaced radios will be returned to Siemens which will then modify them to the V4 specification ready for re-supply to Network Rail. The areas where the worst interference is known to occur will be prioritised, primarily London and the South East, then Manchester. The TOCs are supportive as the project will overcome the nuisance of the interference and will come at no expense to them. One or two TOCs have other more pressing matters on their mind and cross industry collaboration will be required. Whilst this article concentrates on the cab mobile equipment, minimising the risk of interference may also require changes to the radio infrastructure. Smaller cells and altered power levels are likely to be pursued in the most vulnerable areas, but these could well be carried out as part of the GSM-R network enhancement for ETCS provision (see the article on Thameslink telecommunications elsewhere in this issue). The Siemens cab radio has considerable processing capacity, far more than is needed for voice communication or transmission of ETCS data. So why not use this intelligence for other purposes? Equipping the radio to receive GPS signals or, more succinctly, GNSS (Global Navigation Satellite System) that includes gyros and accelerometers to measure train movement and distance travelled, is one such addition. One additional new processor card is incorporated into the radio plus additional aerial sockets for GPS and LTE antennae on the cab roof. This latter will be a combined unit with the GSM-R aerial, thus achieving a like-for-like footprint to facilitate ready fitment. Although all the V4 radios will be so equipped, funding for the GPS connection is only currently authorised for 200 units, which, at £6,000 per cab, will need a sizeable investment package if all fleets are to be equipped. Degraded Mode Working System (DMWS) aka COMPASS. The system to get trains moving much more quickly if a signalling failure occurs was described in issue 162 (April 2018) but, for it to be successful, a train’s position must be verified independent of the signalling system. GNSS information on the train radio can achieve this. Track Remote Condition Monitoring. Whilst the Network Rail fleet of measurement trains (the New Measurement Train ‘Flying Banana’ and others) do an excellent job of monitoring the state of the infrastructure, track and overhead wires, logistics dictate that every track in a route can only be measured every few weeks. 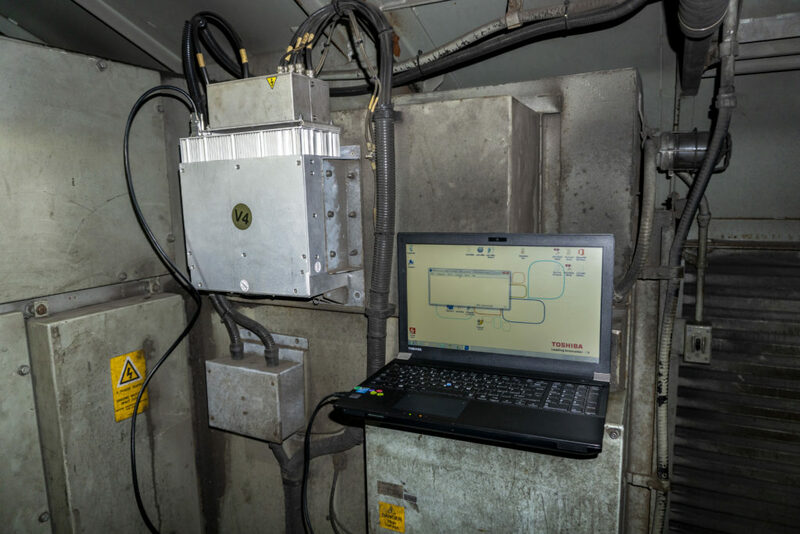 If a number of service trains can be equipped with basic monitoring equipment, then any emerging problem can be noticed more quickly. It is intended to equip the first 200 trains mentioned above with this facility, using the gyros and accelerometers of the GNSS to record the train position, as well as any unusual ride characteristics, that can then be reported in real time. Looking for track defects and rolling stock suspension problems is the basic objective. Phone Books. Train drivers invariably need help if a problem arises during a journey. Problems with the signalling system may need reporting to a Network Rail control centre and problems with the train could need the help of a fleet engineer. Knowing which number to call can be a challenge but having a phone directory immediately available and kept up to date by software downloads would be a real asset. It is the intention that the V4 radio holds such information. DAS (Driver Advisory System). 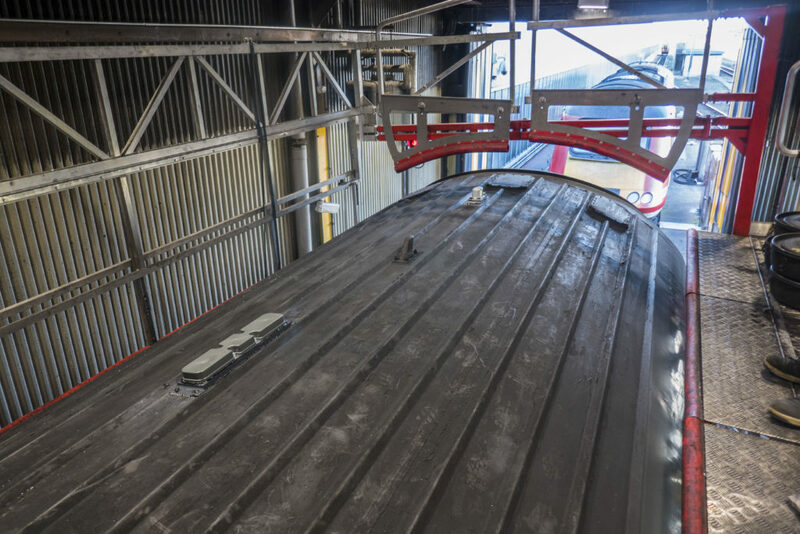 These systems are slowly being adopted by both passenger and freight train companies, although the need to accommodate a separate unit in the driver’s cab and the cost of retrofitting is a disincentive. Siemens has demonstrated that the advice to drivers can be accommodated on the cab radio screen and a limited trial took place between London and Norwich back in 2016 with good results and, apparently, judged favourably by the drivers (issue 137, March 2016). DAS, both in standalone and connected (C-DAS) form, can yield impressive fuel savings as well as optimising time keeping, so having it available almost for free must surely be of interest to the TOCs. This cab radio upgrade project has come about through necessity and will proceed in the quickest possible timescale. The opportunities for using the GSM-R network for much more than a voice communication facility and a bearer for ETCS are there to be seized. Will the industry, both Network Rail and operators, recognise these opportunities and come up with the finance to make them happen? Thanks to Steve Leigh, the Network Rail programme manager for cab radio, for explaining the technicalities and logistics of the project.